The kids had another snow day. They are up to four this school year. I can't remember them having some many before. If this keeps up they will be in school until the end of June. Hmm...maybe that's a good thing. But according to the groundhog yesterday, Spring should be coming soon. I'll believe that when I see it. Mickey went to work this morning. A big front loader plowed our street before 6 a.m. It's so nice to wake up to a loud rumbling engine. But it was even better when it had to back up down the street with the shrill beep! beep! beep! Luckily I went back to sleep or I would have been really mad. Although they finally did a decent job clearing the street. The kids let me sleep in until 10. That was nice of them. Meg and Kade followed their instructions (from Mickey) and cleaned the bathroom. Wow. For a few hours this afternoon I only had one kid since the other two went off to friends' houses to play. Mat and I went shopping. We picked up a few things to make her Valentines and to make some decorations for the house. We also picked up something for each of the kids to keep themselves busy. Mattey finished hers right away. (That's probably because she was enjoying time out of her room. I don't know what we're going to do with her. She's content to live like a slob. Grrr.) Meg and Kade didn't work too long at theirs. Kade ended up going to bed really early with a terrible headache. I hope he's feeling better in the morning. I also hope he doesn't wake up at 3 or 4 a.m. starving and wide awake. That could be ugly if he makes it to school and for Mickey who will probably be woken up by him. I was pleasantly surprised to not see Kade's smiling face until a little after 6. He woke up feeling much better and we even got a few pieces of his puzzle put together before I have to leave for work. 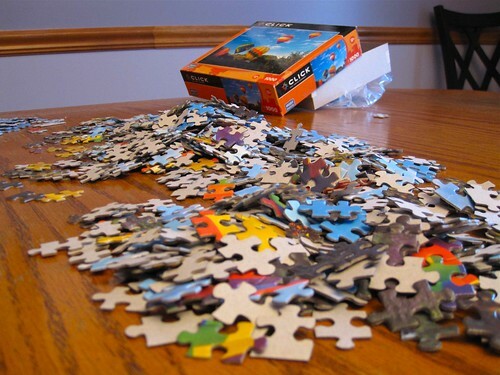 Puzzles are awesome. Maybe I need a new one.